Successfully Added DVR Card - 16 Video and 16 Audio CH (Motion Detection, Alarm) to your Shopping Cart. 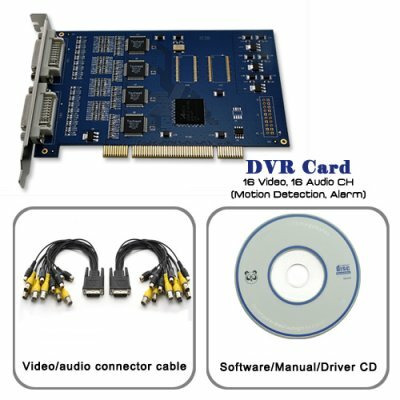 DVR card with 16 channel video input and 16 channel audio input - Turn your computer into a digital video recorder and capture live video feeds directly to the hard drive. This DVR Card is easy to install and even easier to use: Simply connect it inside your computer, install the drivers, plug in the security camera through the handy BNC connectors, and you'll be up and running with the ability to record and monitor amazing realtime surveillance footage from up to 16 security cameras. If that's not enough, the DVR card can also capture audio from up to 16 channels so you are sure to have the context to go with the content.